﻿All components have the same conditional visibility settings available under the Advanced tab. These options will be discussed here so we don’t have to repeat this information under each controls specific section in the document. 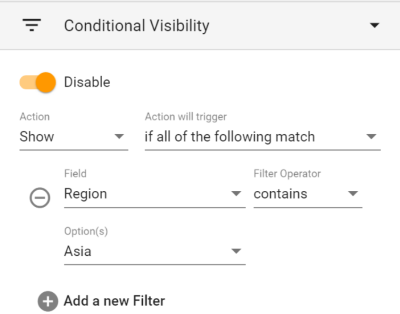 The Conditional Visibility section gives access to options to either hide the field under specific conditions, or to make it required under specific conditions. Enable / Disable This sets if conditional visibility is active or not. If it is enabled you must still set remaining properties for the desired conditional visibility to take place. If you had conditional visibility configured, and you select Disable, those settings will be removed. Hide – Will hide the field if the filter conditions are met. if any of the following match – The action will be triggered if any of the defined filter conditions are met. Adds a new row of two or three fields required to define a new filter condition. Value If “blank” or “not blank” are selected the value field does not show as it is not required. Else a third field appears so a value can be entered to compare the field contents against.